The CNPRC scientists and staff’s daily activities support the responsibility that comes with the privilege of working with animals. They provide a humane environment for the animals in their care, and minimize the number of animals used according to IACUC approved protocols, and are dedicated to ensuring involvement in research is as comfortable as possible and seek alternatives to use whenever possible. 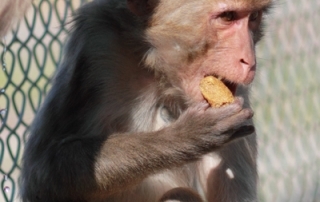 The CNPRC mission ensures the highest quality of animal care and well-being, and demonstrates leadership in the field of nonhuman primate care, enrichment and social housing. 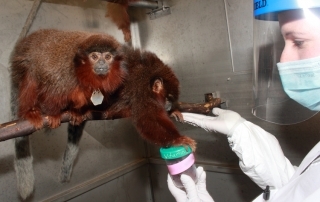 The state-of-the-art research and scientific findings at the Center contribute to the understanding and treatment of human and animal disease, but also increases knowledge of nonhuman primate behavior, nutrition, reproduction, development, health, and social networks, leading to further advancements in the level of care provided. The CNPRC houses approximately 4,000 monkeys for research. 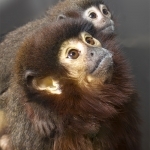 The majority are rhesus monkeys (Macaca mulatta), with a small population of South American titi monkeys (Callicebus cupreus). Approximately 600 infants are born outdoors each year, primarily in the spring. The Center also houses an aged colony, ranging in age up to 38 years, and partially supported by the National Institute on Aging. 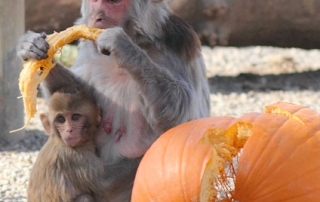 The CNPRC is focused on expanding its colony of “specific pathogen free” or SPF monkeys to improve the health of the monkeys and safety of the personnel. 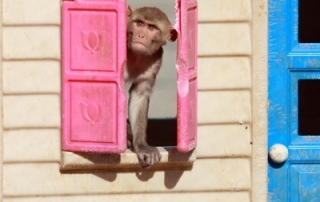 SPF monkeys are bred to be free of several endogenous viruses that, while harmless to monkeys, can have severe and sometimes fatal consequences if contracted by humans. 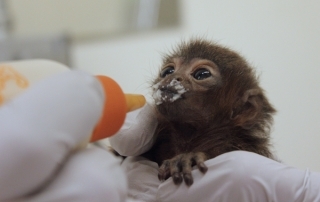 Primate Services is a centralized unit for animal care, colony management, maintenance of facilities, staff training, occupational safety and research support. 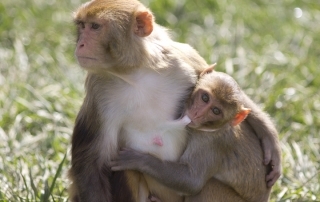 Their goal is to insure the health and well-being of the nonhuman primate colonies and to operate a centralized program that addresses all aspects of animal husbandry and health care. 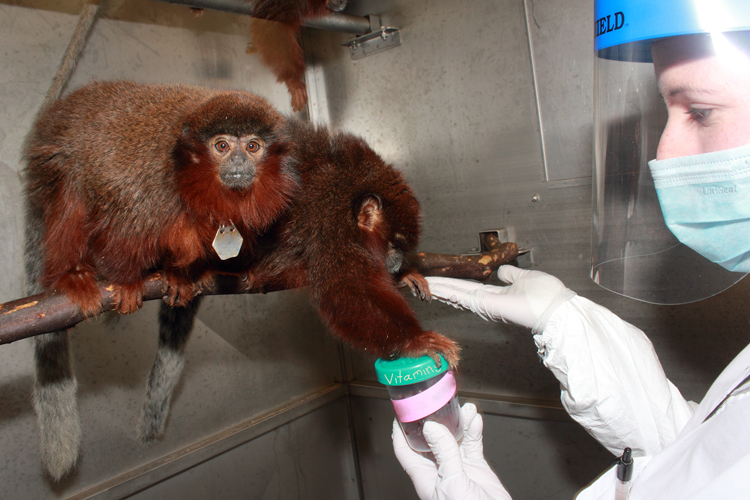 A large staff of veterinarians, veterinary residents and animal health technicians care for the Center’s monkeys as well as provide research support. The animal care staff – about 100 individuals – feeds the animals, keeps their housing areas clean, monitors them daily, and works to promote the well-being of the animals in their care. Animal care staff, veterinarians, and support staff are on-site at the Center 24 hours a day, 7 days a week, year-round. 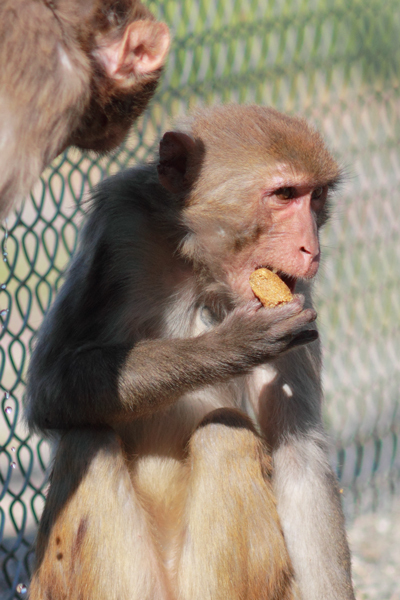 Outdoors, animal care staff feed the monkeys twice a day with a nutritionally complete diet of Purina Monkey Chow (“monkey biscuits”), and clean the outdoor corral substrates, climbing structures and A-frame houses on a regular basis. 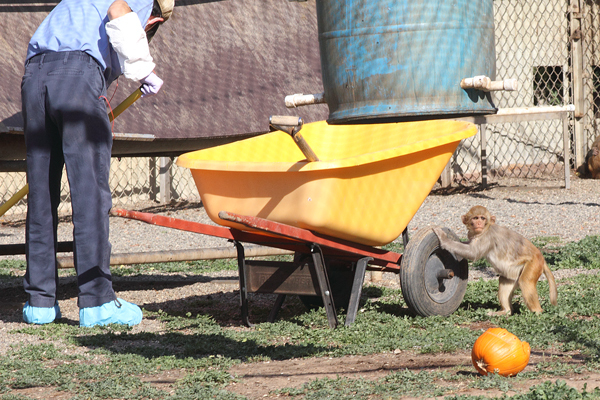 They conduct twice daily health checks during which the monkeys are trained to move around the perimeter of the corral in order to give staff an opportunity to visualize each animal and be alert for those that might need some additional attention. Staff are familiar with each animal’s history, personality, and relationship with other animals, and are able to recognize immediately if an animal requires a visit to the CNPRC veterinarians. 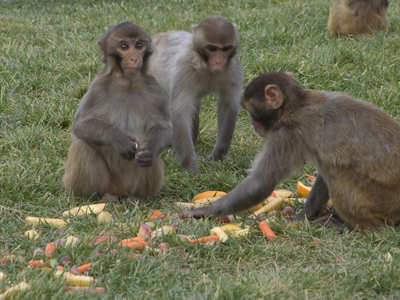 Indoor housed animals are also fed monkey chow and fresh fruits and vegetables, in addition to enrichment foods (see Enrichment, to right). 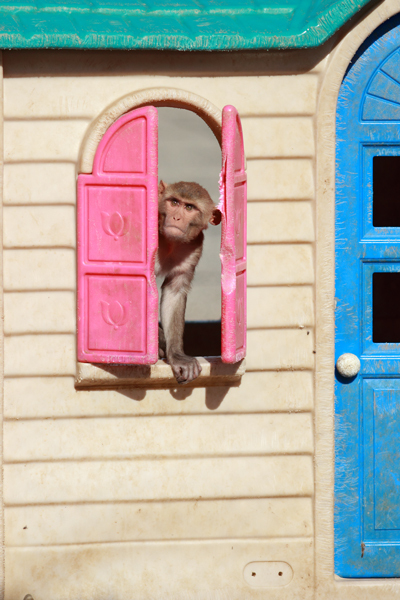 They are housed in enclosures that allow them to spend the daytime hours with another animal – either male or female pairs, or male / female pairs and offspring. 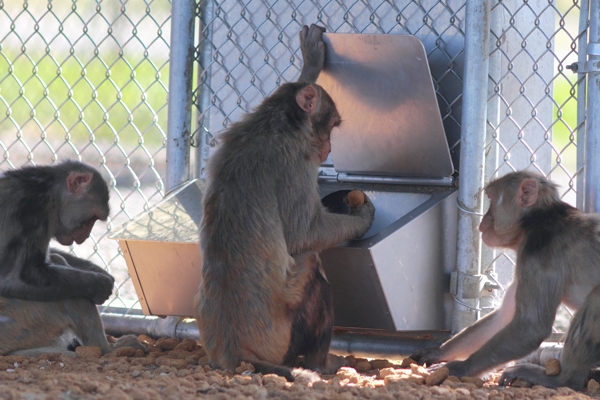 Animals are housed separately at night when fewer staff are available to monitor interactions. From late January through June is birthing season at the CNPRC. 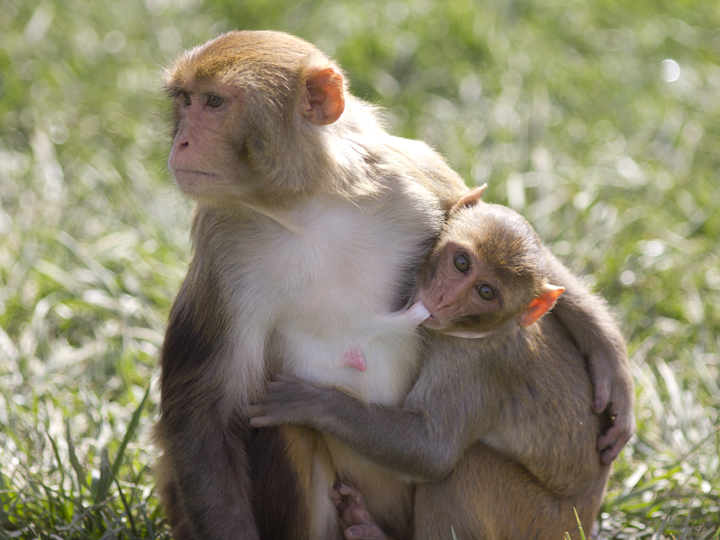 Rhesus females live with their older offspring and other relatives in the field corrals, and give birth unassisted usually during early morning hours. 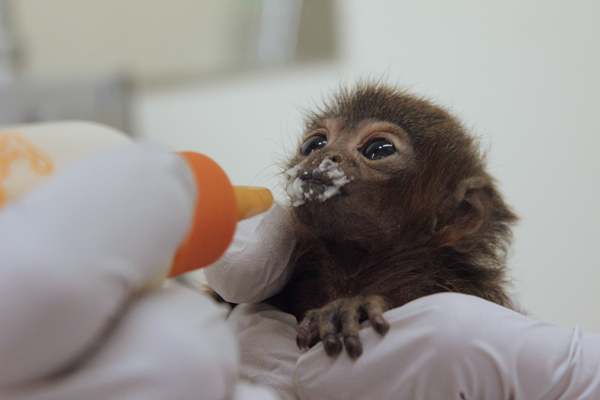 Animal care staff keep a close watch on all of the animals at all times, and take special care during birthing season to note births, ensure sufficient milk production and infant handling skills, and provide assistance when necessary for the health of the infants and dams. Animal care personnel make a long-term commitment to ongoing education, and are trained in the latest techniques in laboratory animal care and well-being. Over 95% of our animal care staff have advanced training in animal care techniques and are educated in behavior and enrichment and other topics to enhance their understanding of the animals’ health and well-being. CNPRC Core Scientists provide staff seminars where staff learn how their efforts contribute to the success of the research. Over half of the animal care staff have taken advantage of an established, in-house training program that provides the opportunity to advance knowledge and careers, such as Assistant Laboratory Animal Technicians receive certification as a Laboratory Animal Technician (LAT). The CNPRC is a component of the UC Davis Association for Assessment and Accreditation of Laboratory Animal Care International (AAALAC)-accredited program. 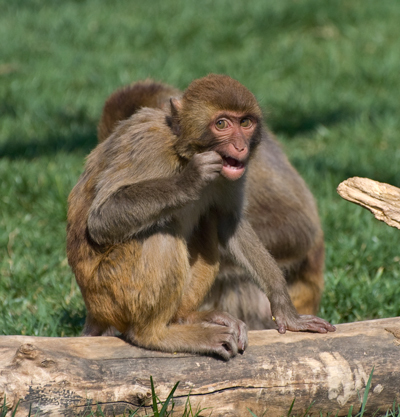 The most recent AAALAC review (2016) of the UC Davis Animal Care Program resulted in Full Accreditationwith no suggestions for improvements, attesting to the high quality standards for animal research at UC Davis and the CNPRC. At UC Davis, a single Institutional Animal Care and Use Committee (IACUC) oversees all animal use in research and teaching in order to ensure that the highest animal welfare standards are met across the campus. The IACUC, a faculty-based committee with 25 members (e.g., faculty, facility staff, UC Davis Attending Veterinarian, IACUC staff, public non-affiliated members, non-scientists) inspects all animal facilities, establishes policy and procedure for the UC Davis campus, and coordinates training, compliance, and occupational health programs. See Oversight and Regulations for more information. The CNPRC has a model environmental enrichment program for the benefit of all animals, indoors and outdoors. The goal is to provide daily enrichment and to facilitate psychological well-being through provision of multiple forms of environmental enrichment. 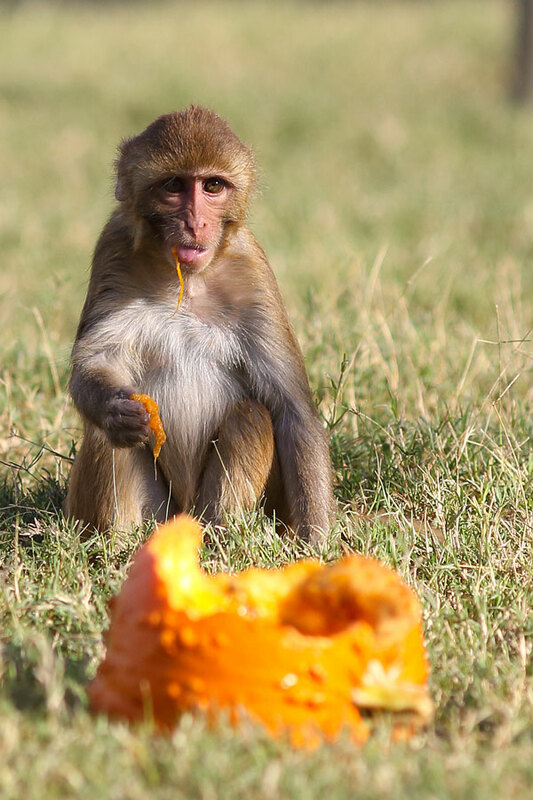 In addition to a nutritionally complete diet of monkey chow, seasonal produce is provided to all of the animals on a once- to twice-weekly basis. 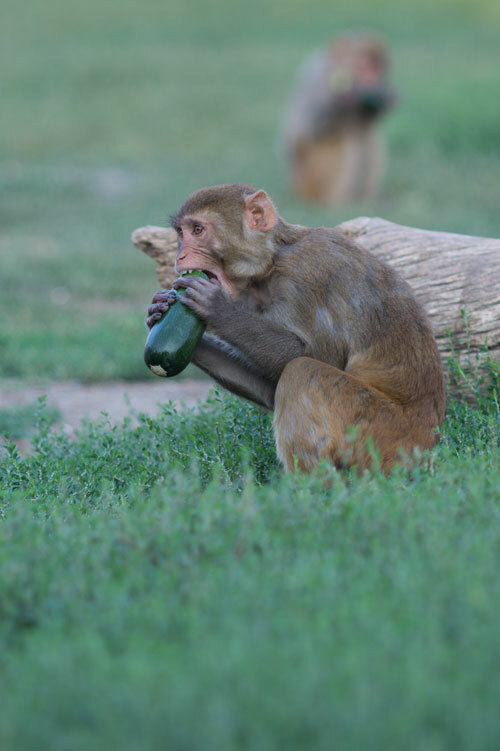 This produce provides additional variation to the diet, and also enriches the animals’ natural behaviors of foraging and processing food items. 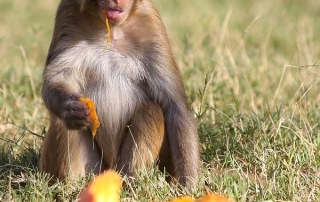 These include broccoli which is eaten stem first, cherry tomatoes, and sliced apples, carrots, sunflower seeds, and oats which are picked from the grass and stored in cheek pouches. 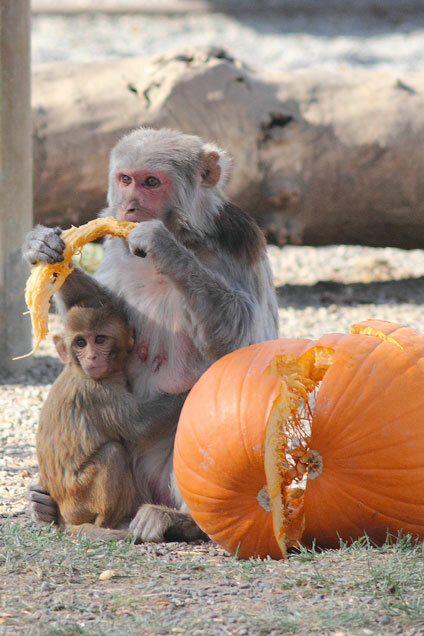 Halloween pumpkins are donated yearly by a local farmer, and pumpkins are enjoyed both as climbing toys and snacks. 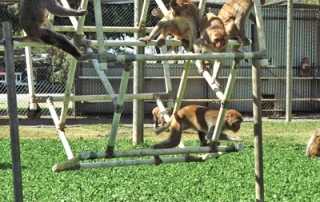 Field corrals contain climbing structures, play houses, slides, barrels, tree trunks, and unique enrichment structures built by the CNPRC staff. 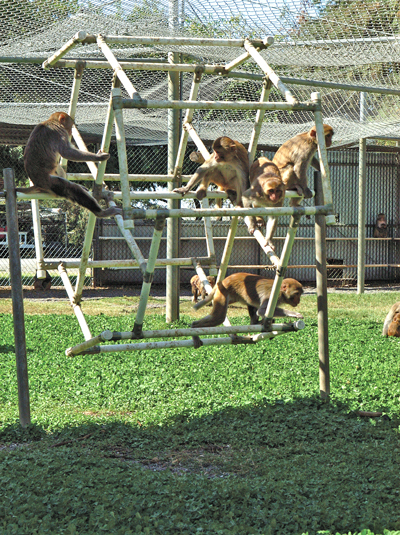 These all provide safe ways to allow the monkeys to participate in normal behaviors and also enriches their environment. 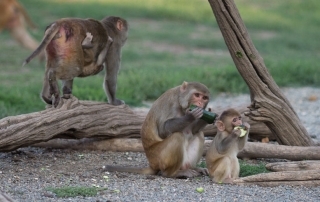 For indoor animals, daily socialization is achieved by careful pairings, and monkeys are provided with puzzle feeders, fresh produce, “reality” TV (video of wild and outdoor housed monkeys), mirrors, and treat foods. 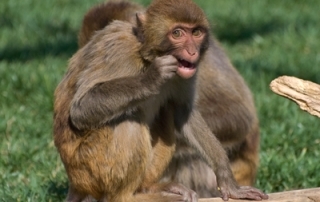 Behavioral Health Services is a component of the Primate Well-being Plan that both monitors the populations and advises the Enrichment Program for all of the nonhuman primate colonies. 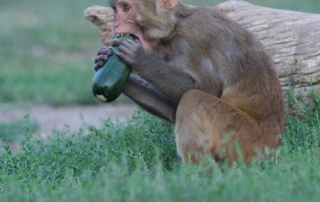 Behavioral Health Services staff develop and implement best strategies to promote social stability of CNPRC monkey populations through: behavior monitoring, socially managing the outdoor colonies using sophisticated network-based approaches; systematically assessing the behavior of the monkeys in the indoor colonies; evaluating the efficacy of current and new social and environmental enrichment; and developing proactive strategies to support well-being. 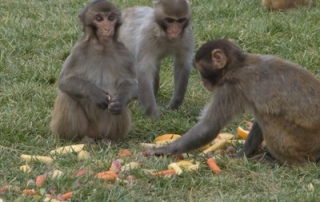 One unique approach of these services is utilization of a cooperative training program that emphasizes positive reinforcement techniques for colony management purposes and constructive human-animal interactions. 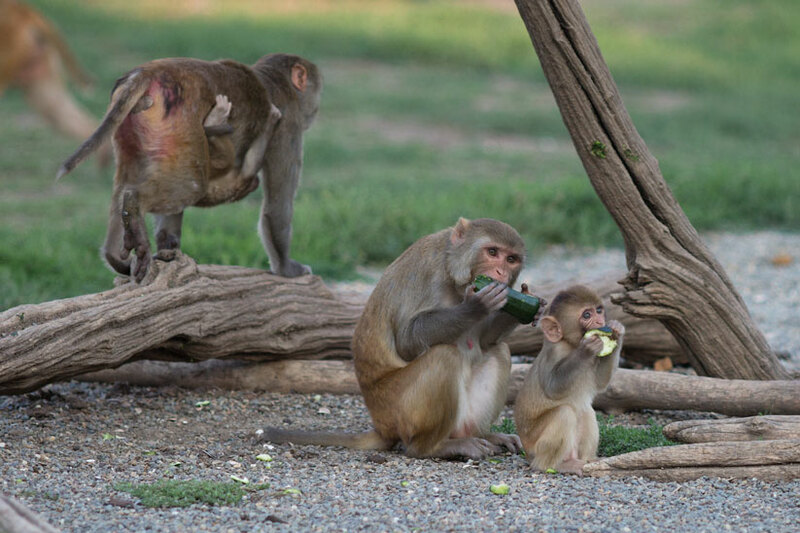 Proposals for research studies involving monkeys must be reviewed and approved by the UC Davis Institutional Animal Care and Use Committee (IACUC), which ensures that the project meets all federal laws governing animal care and use. Projects are also reviewed internally by the CNPRC Research Advisory Committee. The CNPRC is a part of the UC Davis Animal Care Program which is accredited by the Association for Assessment and Accreditation of Laboratory Animal Care International (AAALAC), a private, nonprofit group that promotes the humane treatment of animals in science through voluntary accreditation. UC Davis is one of more than 770 research institutions and other organizations that have earned AAALAC accreditation, demonstrating its commitment to responsible animal care and use. In addition, the CNPRC has regular, unannounced inspections by the U.S. Department of Agriculture, as required by the Animal Welfare Act passed by Congress in 1966. Please see Oversight and Regulations for more information.